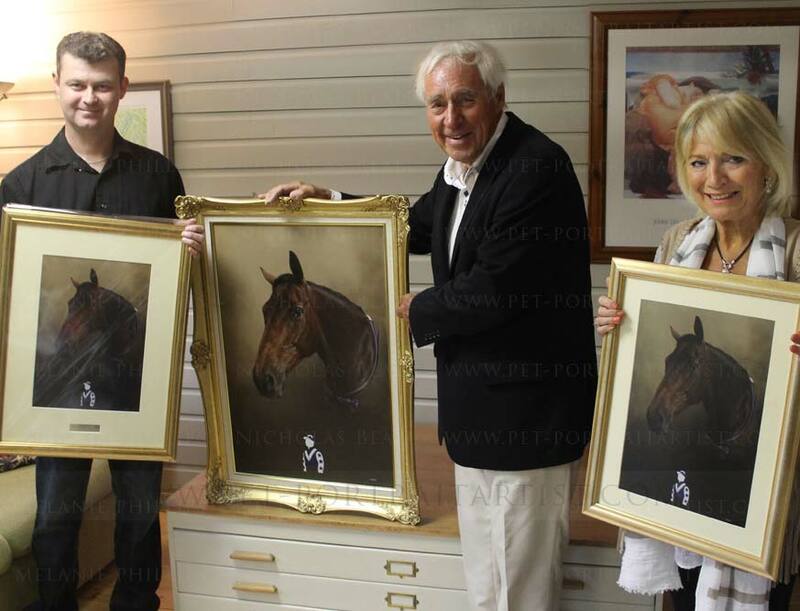 Ted Andrews, a returning client, from the UK contact us in 2015 about Nicholas' Retired Race Horse Portraits. 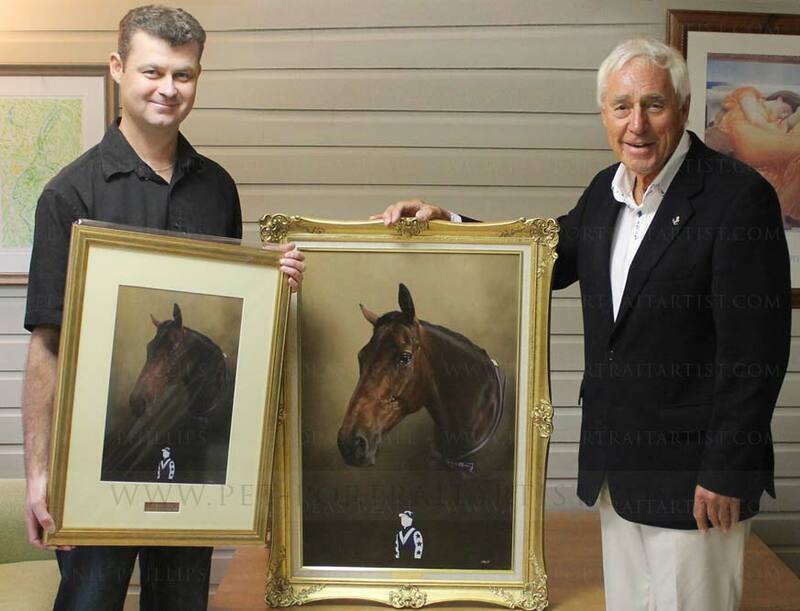 He wanted to commission Nicholas to paint his retired racehorse Ballycastle King. Ted requested the size 30 x 20 to match other paintings we have completed for him over the years. 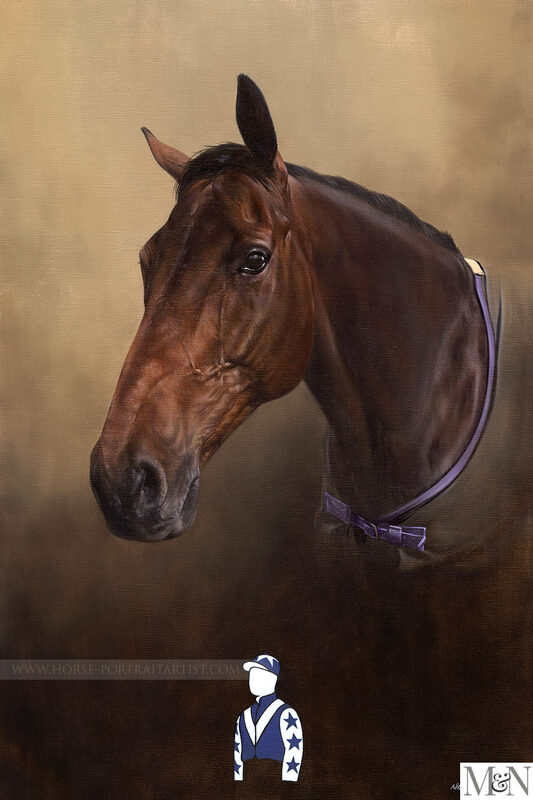 The horse, owned by both Ted and his niece, requested the addition of the racing silks also to be depicted with the correct racing colours on the painting too. You can see this just below the painting of Ballycastle King. I took a few photos of Nicholas holding his paintbrush to help give scale which I have added along with the final scan and close up detail. The portrait has been framed in a handmade bespoke swept frame, here in the UK, along with a hessian slip. The painting is complimented by a beautiful engraved plaque. Ted and Janice visited the studio to collect the painting along with two framed prints. We all went out for a beautiful meal to celebrate the paintings and catch up too. A wonderful commission and a perfect evening. Ted and Janice visited our studio to collect their painting and two prints. I took the opportunity of taking a few photos of them with Nicholas before they took the painting and prints home. Happy faces and big smiles all round! We work with a wonderful engraver who creates engraved plagues for us in either a mirrored or brushed finish, in Silver or Bronze. The plaques are superb quality, really heavy and very well made. If you would like an engraved plaque for your portrait, just drop us a line and we can chat about your frame choice. 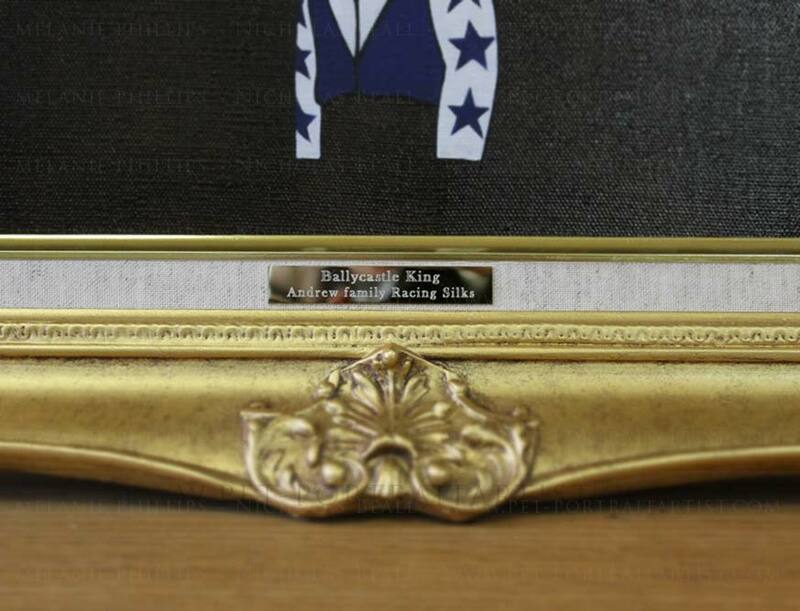 It is important to have a relatively flat area to place the plaque on the frame itself. The frame below was perfect as the plaque was attached to the inner linen slip area of the frame and works beautifully. We try to take photos of our portraits up close so that viewers can see the final painting detail in the portraits. 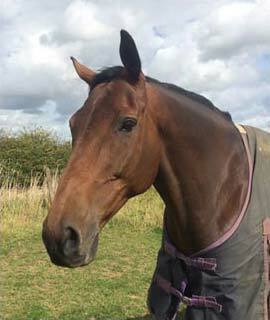 The photos below depict the detail that has gone into the shiny eye and beautiful muzzle. We hope you enjoy viewing the photos. 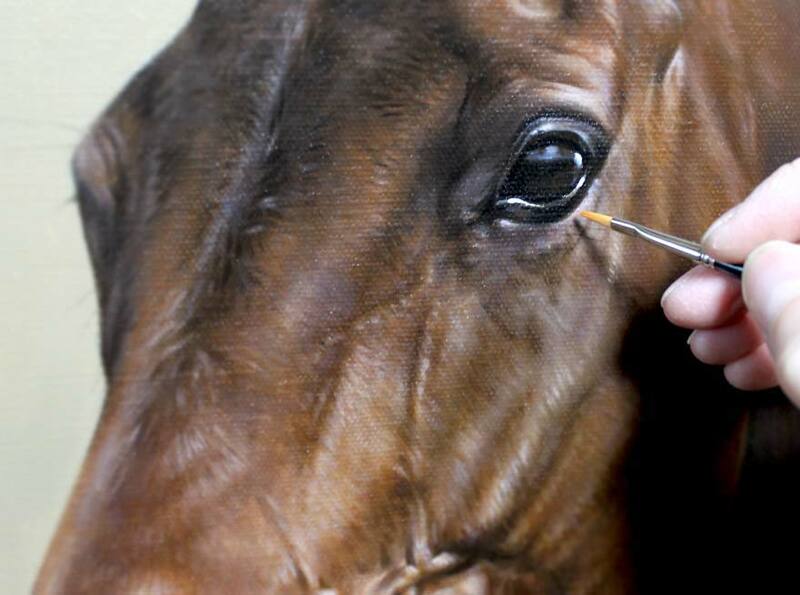 We If you have a horse that you would like traditionally hand painted in oils on canvas, you can contact us at any time from our Horse portraits contact page. 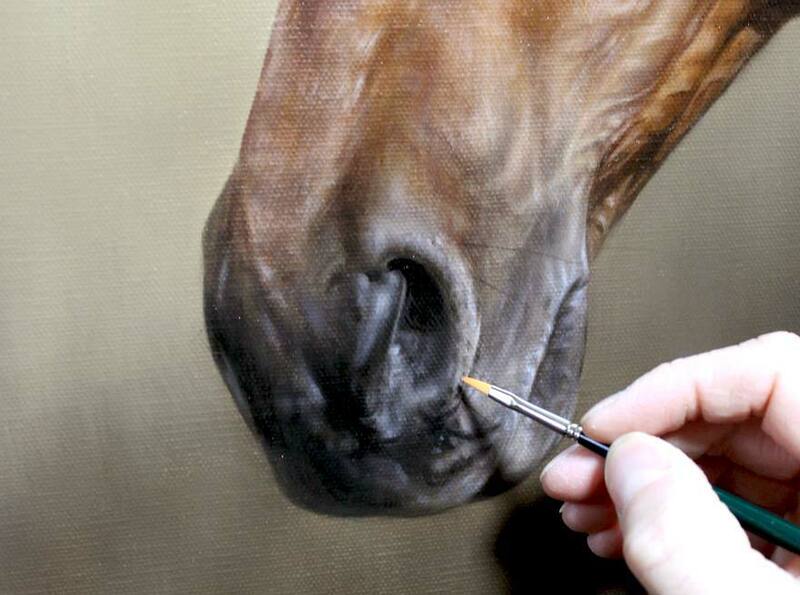 Nicholas specialises in realistic, paintings of horses from your photos and we are always happy to work with clients on their ideas for a painting. Every painting Nicholas creates is completely unique and special! We look forward to hearing from you soon!